Spring is practically here in the Pacific Northwest and I've already sown some seeds in my garden. My peas and arugula have germinated and I'm excited to plant more veggie seeds and starts as the weather gets warmer. Winter and early spring are a great time to buy seeds and plan your garden. If you've spent any time browsing seed catalogs or perusing the seed racks at your favorite garden center, you probably know that there are a multitude of choices to make when selecting seeds. The same goes for plant starts. My goal today is to clear up any confusion about some of your seed and plant start choices. Understanding the difference between open pollinated, heirloom, hybrid, and genetically modified seeds is crucial to selecting the right seeds for your garden, whether you're planning to save your own seeds or just simply eat your garden's bounty. First, here's a brief lesson on plant taxonomy so that the terminology below makes sense. The highest level of plant classification is the plant kingdom. From there, plants are classified by: division, class, order, family, genus, and species. (This classification is actually more complex, but we'll keep it simple). Under species, plants are broken down even further into varieties. For this discussion, we are most interested in the genus, species, and varieties. Genus: The genus is the first word in the plant's Latin name (note that the Latin names are always italicized) and the genus is always capitalized. To avoid getting too technical, plants in the same genus can be easily recognized as being part of the same group. An example of a genus is Brassica. Some examples of plants in the Brassica genus are broccoli, kale, kohlrabi, cabbage, collard greens, Brussels sprouts, mustard, turnip, and cauliflower. Species: The species is the second word in the Latin name and it is not capitalized. The species further divides the individual plants in the same genus. This part of the name is often used to describe more specific traits of a plant, such as color or leaf shape. An example of a genus and species is Brassica oleracea. In this species, you will find broccoli, kale, kohlrabi, cabbage, collard greens, Brussels sprouts, and cauliflower. Variety: A variety may or may not be part of a plant's Latin name. A variety is only slightly different than other plants in the same species. It's not different enough to warrant it's own species name. An example of this is Brassica oleracea var. gongylodes. Commonly known as Kohlrabi. Another example is Lacinato Kale or Brassica oleracea var. palmifolia. With that brief plant taxonomy lesson finished, let's get into the different types of seeds. There are natural variations within open pollinated plants. This genetic diversity allows the plants to naturally adapt to specific site conditions over time. To ensure that seed quality is maintained or even improved, only seeds from the best plants should be saved. Heirloom seeds are those that have been passed down within a family or community. Seeds are identified as heirloom based on the length of time the seeds have been passed down or by it's generational history. 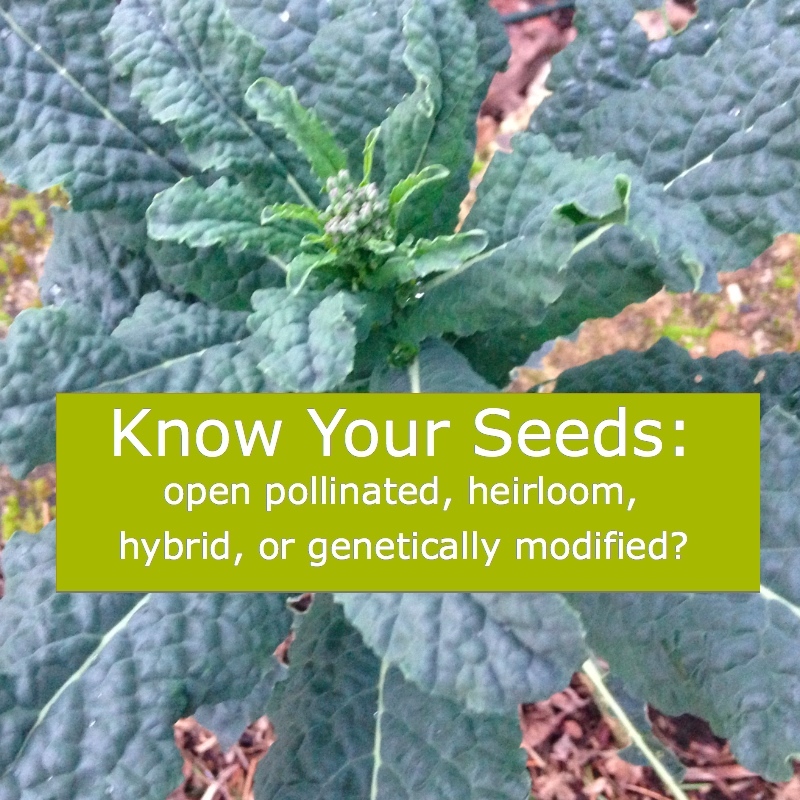 All heirloom seeds are open pollinated. Hybrid seeds are created by crossing one variety of plant with another. Hybridization occurs naturally when plants of different varieties are growing near enough to one other. With hybrid seeds, the more cross pollination that happens, the more variations you will find within the saved seeds. If you have a small garden and plant several different varieties of Brassica oleracea, chances are good that you will naturally end up with hybrid seeds. Hybrid seeds are not true to their parent plants. Genetically modified seeds are the newest way of breeding seeds. Genetic modification is performed in a lab and is done by taking genes from one species and inserting it into another species. Genetically modified plants like corn, soybeans, cotton, and sugar beets are genetically altered to tolerate herbicides, so fields can be sprayed for weeds without killing these plants. These types of seeds would never occur in the wild. Preventing genetically modified species from crossing with non-genetically modified species can be difficult, thus compromising the integrity of our open pollinated plants. When you are purchasing seeds, first consider what your goals are. Are you interested in growing things that you can't find in the grocery store? Will you be saving your seeds for seed swaps and planting next year? 1 - These are the plants that humans have been growing for thousands of years. By growing them, you are becoming part of that story and helping these seeds live on. 2 - Many heirloom varieties are not available in grocery stores, so you will be growing unique varieties in your own garden. 3 - You can easily save your seeds. 4 - You are helping to conserve natural genetic diversity in our food supply. If you'd like to avoid genetically modified seeds, a good place to start is to shop for organic seeds, open pollinated seeds, heirloom seeds, and seeds with a NON-GMO Project Verified label. Also, check out seed swaps in your area. Seed swaps are an excellent place to find unique seeds that have naturally adapted to your local climate. I'd love to hear from you! What seeds will you be planting this year? Where do you buy your seeds?